Lived c. 610 BC – c 546 BC. 2,600 years ago, Anaximander became the first person in recorded history to recognize that the earth exists as a solitary body which does not need to rest on top of anything else. Fascinated by the structure of the earth, he produced one of the first ever maps of the world. He did not restrict his thinking to astronomy and geography. He also theorized about evolution, concluding that life had first arisen in wet rather than dry conditions. He proposed that the first humans had been produced from fish. Anaximander was born in approximately 610 BC in the Ancient Greek city of Miletus (now in Turkey). His father’s name was Praxiades. His mother’s name is not known. None of Anaximander’s work survives. What we know of him was written by authors such as Aristotle in later times. One of the most significant features of Anaximander’s early life is that he was born in the city of Miletus. Now largely forgotten, at the time of Anaximander’s birth the city was booming. It had grown into the greatest and wealthiest city in Ancient Greece. About 14 years before Anaximander was born, Miletus had been the birthplace of the first scientist in recorded history, Thales. In fact, Anaximander was possibly a blood relative of Thales. Thales had traveled to Ancient Egypt, and possibly Babylon, where he had learned mathematics. After returning to Miletus, he had lifted mathematics to new, magnificent heights, inventing deductive proof and establishing pure mathematics as a separate discipline from applied mathematics. Thales established the Milesian school. In doing so, he set in motion the triumphant journey of mathematics through the islands and cities of Ancient Greece – a journey that would peak three centuries later with the brilliant work of Archimedes. Anaximander was one of Thales’ first students, perhaps the very first. Pythagoras was one of his later students. 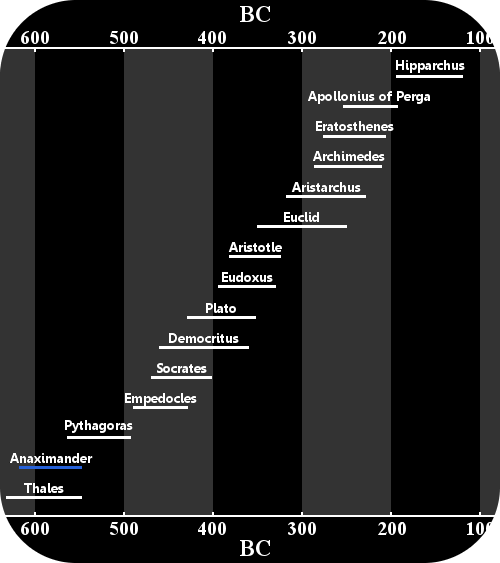 Pythagoras was also taught by Anaximander. Thales’ core belief, which he passed to Anaximander, was that rational explanations rather than the Ancient Greek gods should be used to account for natural phenomena. Anaximander’s ambition was startling. His overriding goal was to understand and explain the universe. Anaximander had learned from Thales that the earth is a disk floating in an infinite ocean of water. Thales’ theory suggests that he had looked at the night sky and seen lots of bright disks. Describing the earth as a disk would therefore have seemed perfectly logical. Alternatively the disk idea might have come from the fact that the horizon, provided it’s unobstructed, is circular. Anaximander modified Thales’ theory in a remarkably productive way. He completely discarded the ocean that Thales said supports the earth. Anaximander said there is nothing underneath the earth supporting it. He asserted that the earth floats in the center of infinity, held in position because it is an equal distance from all the other parts of the universe. This is a strikingly sophisticated argument. More than 2,000 years before Newton’s law of gravity, Anaximander’s point of view seems to incorporate a subtle hint of Newtonian-style thinking, conceiving of a force of attraction between the earth and the planets and stars we see in the heavens. Anaximander had made an immense conceptual leap. For the first time in history a human mind had grasped the idea that it is possible we live upon a mass that needs nothing below it. 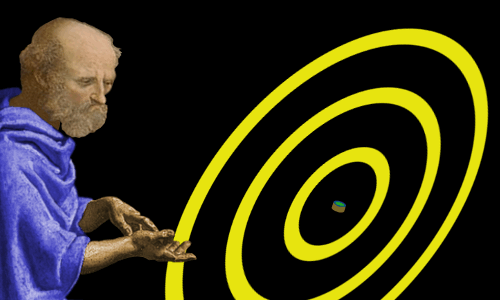 It is difficult to overstate how important Anaximander’s revelation was for the future of astronomy and science. 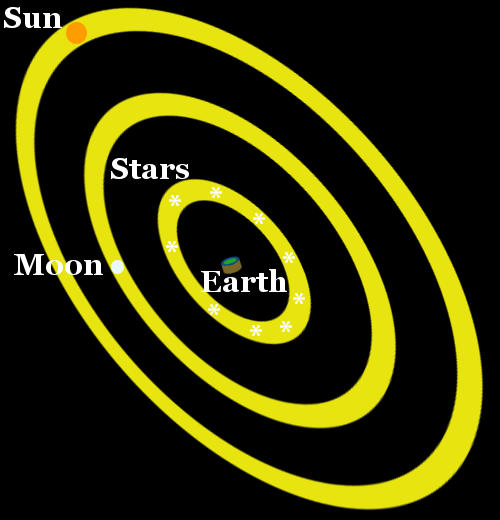 Without his insight, Aristarchus and (many years later) Nicolaus Copernicus could never have made the further intellectual leap needed to say that the earth orbits the sun. How is the Universe Put Together? Anaximander did not believe the universe he saw had always existed. He said it had grown from a seed – a primordial substance called Apeiron. The Apeiron was infinite and could not be created or destroyed. Everything we can sense in the universe had grown from it. Tradition said that the sky was a solid hemisphere containing the heavenly bodies. It was supported above the earth by one of the Titans of Greek myths – Atlas. Anaximander said that the heavenly bodies did not all lie on a single great celestial hemisphere. He placed the sun, the moon and the stars at different distances from Earth. However, after getting this right, he got the details wrong. He imagined there were three rings of fire around earth – one for the sun, one for the moon, and one for the stars. The fires, he said, were enclosed in rings and hidden from us apart from holes that allowed their light through. The holes could change shape, which accounted for the moon’s phases. The holes could close, accounting for solar eclipses. The fire in the moon’s ring was cooler than the fire in the sun’s ring. Although he correctly said the moon was closer to us that the sun, he incorrectly placed the stars closer to us than the moon. Anaximander’s universe. The sun, moon, and stars are holes through which we can glimpse the fires within the three enclosed rings that surround the earth. Each ring of fire is the same width as the earth. The sun’s ring begins 27 earth-widths away from the earth. To people today, Anaximander’s fire-rings look crazy. However, the fact that he imagined rings going all the way around Earth also allowed him to visualize an Earth that needed no support. So, despite the apparent craziness of his fire-rings idea, it led to a revolution in our understanding of the universe. Anaximander accepted Thales’ idea that the earth is a rather deep disk. We live on one side of the disk. We do not know what exists on the other side. He believed the depth of our disk-world was a third of its width. Anaximander was clearly obsessed with visualizing the universe, how the earth related to the rest of the universe, and what the earth’s surface looked like. One result of this is that he created a map of the world, much more extensive than any known before it. He compiled reports from anyone who had traveled outside Greece and tried to present the information in visual form. The map no longer exists, but from descriptions written by Heroditus, who lived a century after Anaximander, we may theorize that it looked something like the one below. 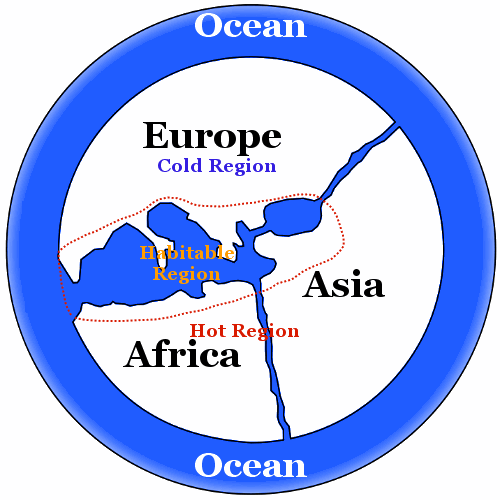 Anaximander’s world map might have resembled this one. Anaximander believed that the world we live on has not always existed and will not always exist. He believed worlds had existed before ours and others would exist after ours. Thales had attempted to explain earthquakes as a natural phenomenon rather than the actions of angry gods. Anaximander did the same for lightning storms, which he said are caused by disturbances in the air. Lightning results from violent air flow, while thunder results from the collisions of clouds. Anaximander looked at the life around him and came to the conclusion that it must have evolved from other lifeforms. He believed the world’s first lifeforms originated in the world’s wetter environments, then evolved into more advanced forms and spread to drier places. He believed humans could not have appeared on Earth in their current form. His reasoning was that the young of some animals can look after themselves from the time they are born. Human children, however, need to be taken care of for many years. If this had always been the case, humans could not have survived. Anaximander speculated that our ancestor may have been a fish-like creature which gave birth to humans when they had reached an age when they could survive without parents to look after them. Anaximander is believed to have died at about the age of 64 in c. 546 BC. "Anaximander." Famous Scientists. famousscientists.org. 28 Nov. 2015. Web.